The Academic Integrity Module is a short course you can take to brush up on your knowledge of plagiarism. It should only take you ten minutes to complete. Completing this module may be a requirement for students caught plagiarising. The Module defines plagiarism, unpacks it's ethical implications and gives tips and instructions for avoding plagiarism. Definition: "Plagiarism is the act of presenting another person’s work (including ideas, writing, conversation, song, and words) as your own. When using another person’s work, even when paraphrasing, you must acknowledge it fully and appropriately, unless the information is common knowledge." (from StudentGuide.org). The consequences of plagiarism can be very serious. Your education institution can make you re-do the assignment, they can reduce your grade or fail you for the assignment completely. You can even be charged with academic misconduct and be expelled. Academic misconduct on your record can cause problems after you graduate and are looking for employment. You are paraphrasing/summarising someone else's words. You are using someone else's ideas or concepts. If it is common knowledge or you own thoughts - you do not need to reference. MacRob subscribes to a service called 'Turnitin' - you may be asked to submit your work through this system. Many universities also use Turnitin to check for plagiarism. When you upload your work to Turnitin, it is compared against the world's largest academic database. It then shows how much of your submission matches content from the database, and thus how much is your original work and how much has been copied - with or without correct citation. This unoriginal content is highlighted and colour coded, and given as a percentage. 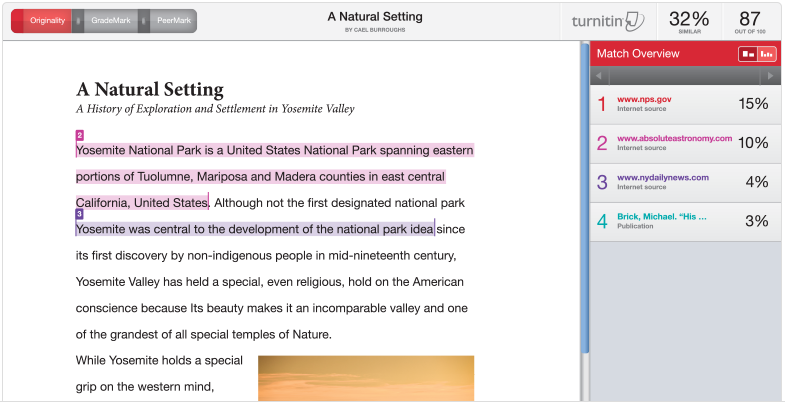 This enables your teachers to see whether you have plagiarised your work. Breaching copyright is illegal. If you copy and paste text, images or sounds into an assignment or presentation without proper permission you may be breaking copyright law. This has consequences that reach outside of your school or university. To avoid breaking copyright rules, you can use content that is under a Creative Commons license. This allows you to share, reuse and remix material legally. There are six different types of creative commons licenses, but all of them still require that you attribute the work of the author. Read the fact sheet below for information on these licenses.